Measuring the World marks the debut of a glorious new talent on the international scene. Young Austrian writer Daniel Kehlmann's brilliant comic novel revolves around the meeting of two colossal geniuses of the Enlightenment. 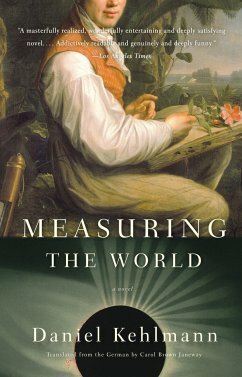 Late in the eighteenth century, two young Germans set out to measure the world. One of them, the aristocratic naturalist Alexander von Humboldt, negotiates jungles, voyages down the Orinoco River, tastes poisons, climbs the highest mountain known to man, counts head lice, and explores and measures every cave and hill he comes across. The other, the reclusive and barely socialized mathematician Carl Friedrich Gauss, can prove that space is curved without leaving his home. Terrifyingly famous and wildly eccentric, these two polar opposites finally meet in Berlin in 1828, and are immediately embroiled in the turmoil of the post-Napolean world. Daniel Kehlmann was born in 1975 in Munich, the son of a director and an actress. He attended a Jesuit college in Vienna, traveled widely, and has won several awards for previous novels and short stories, most recently the 2005 Candide Award. His works have been translated into more than twenty languages, and Measuring the World became an instant best seller in several European countries. Kehlmann is spending the fall of 2006 as writer-in-residence at New York University's Deutsches Haus. He lives in Vienna.